My husband and I recently checked out a new sushi place in our area. My husband was blown away by this raw tuna dish I picked out. 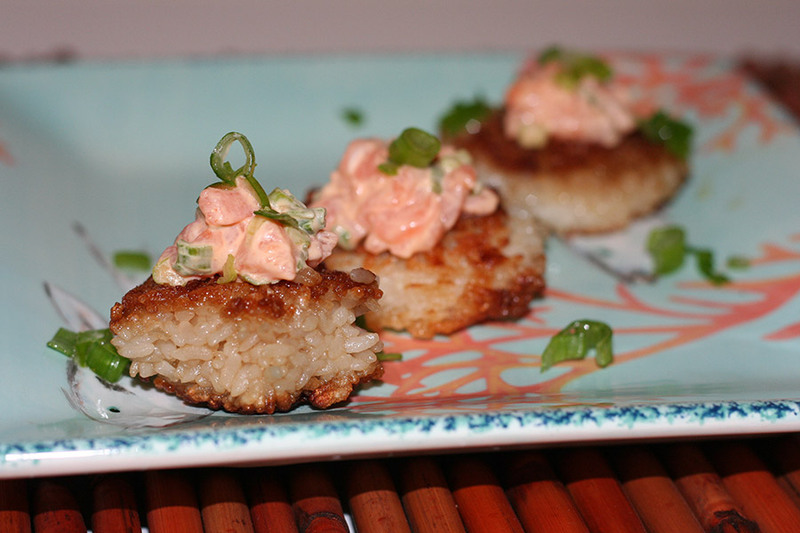 The spicy tuna was served over these crispy rice cakes. He gushed over the dish and told me that I had to cook up something similar as soon as possible. His raw fish of choice is usually salmon. So the next weekend, he made a beeline for the market and bought around a half a pound of sushi-grade wild salmon. He pulled out the rice cooker and begged me to make my version of the dish. I made some sushi rice and seasoned it. I then shaped it in to various shapes. I tried shaping it both with my hands and with a rice mold. I then pan fried it in a combination of rice bran oil and sesame oil. While frying the rice cakes, I lightly sprinkled the cakes with some soy sauce for extra flavor. While the rice cakes were crisping up, I got to work on the salmon. I skinned the salmon. I saved the salmon skin for sushi rolls. 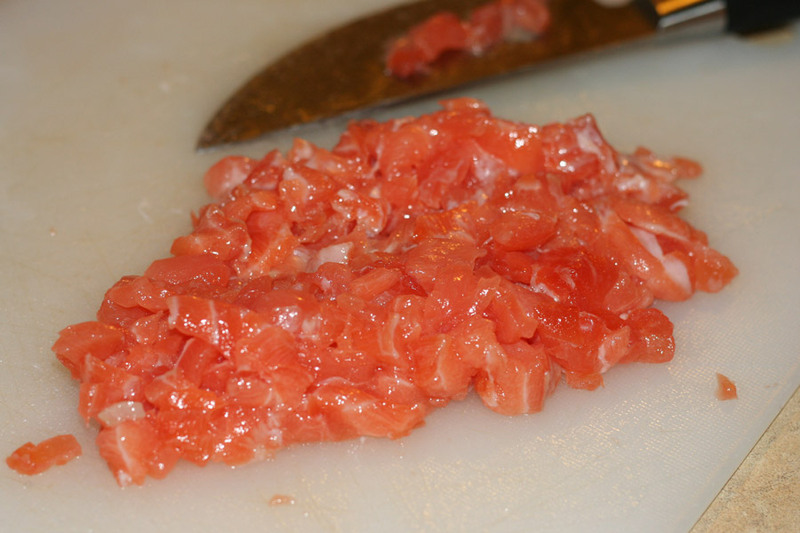 I then chopped up the salmon in to small bits. 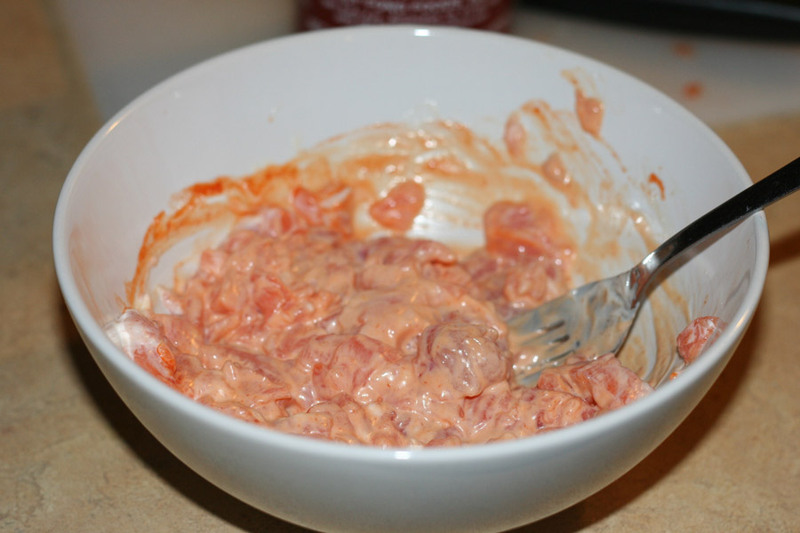 I mixed the salmon with some mayonnaise, some sriracha, sesame oil and chopped scallions. I served this mixture on top of the rice cakes. You can dip the rice cakes in additional soy sauce if desired or serve with wasabi or even more sriracha. Enjoy! Cook the sushi rice and season with seasoned rice vinegar. Chop up the raw salmon and place in a bowl. 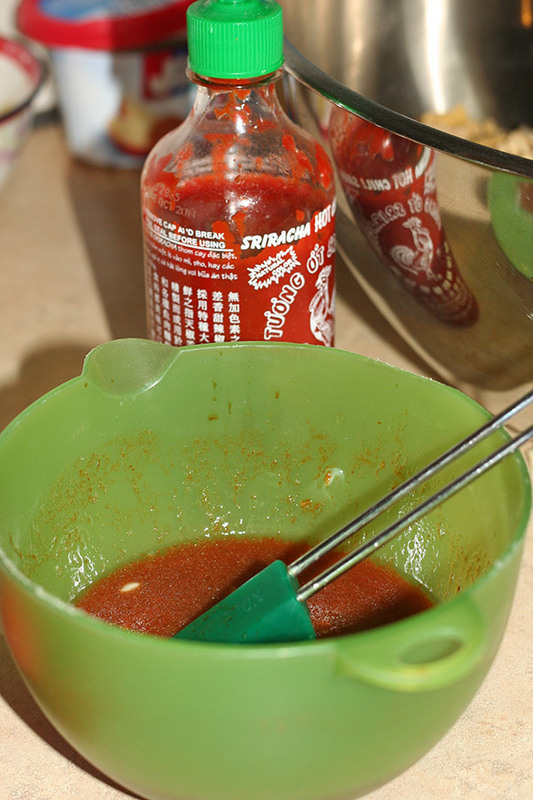 Mix in the mayonnaise, sriracha, sesame oil and scallions. 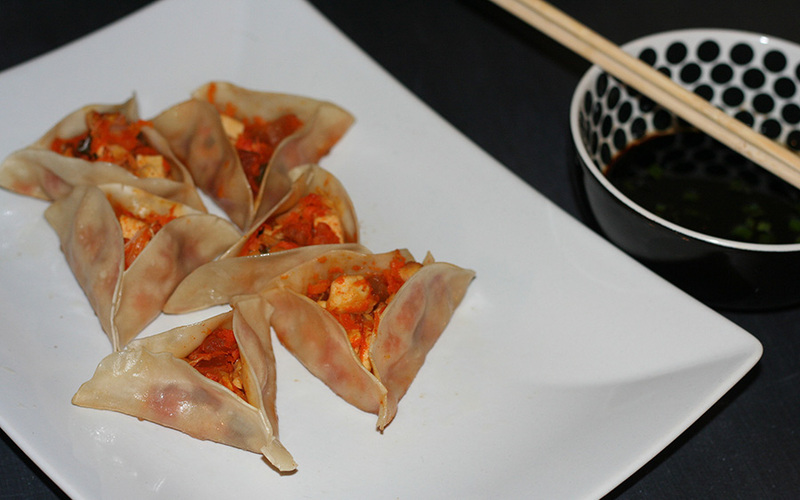 Form the cooked sushi rice in to shapes and fry in the heated and oiled pan. Let the rice cakes brown a bit on each side. Sprinkle soy sauce over the rice cakes and brown some more. The rice cakes should be crispy. Place a dollop of the salmon mixture over each rice cake and enjoy! 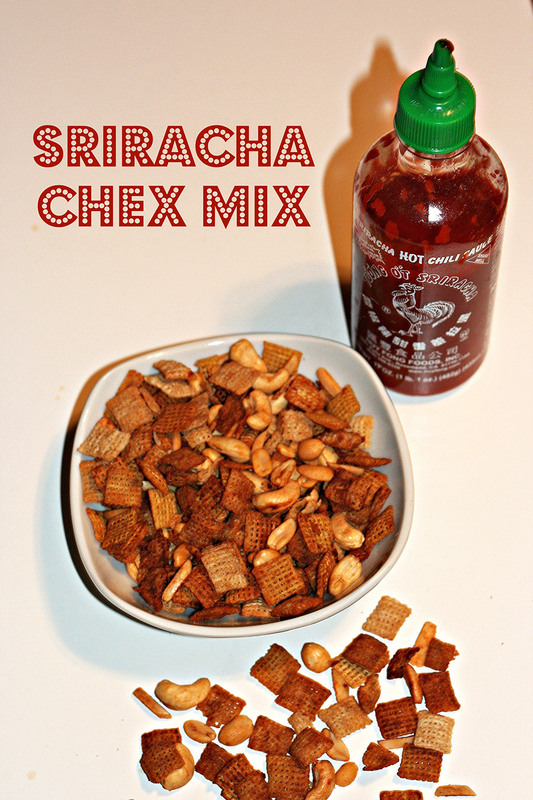 Serve with soy sauce, extra sriracha and/or wasabi. I am very fortunate to live and work in areas where I have easy access to fresh, organic produce from local farms. My local farmer’s market often determines any given dinner. 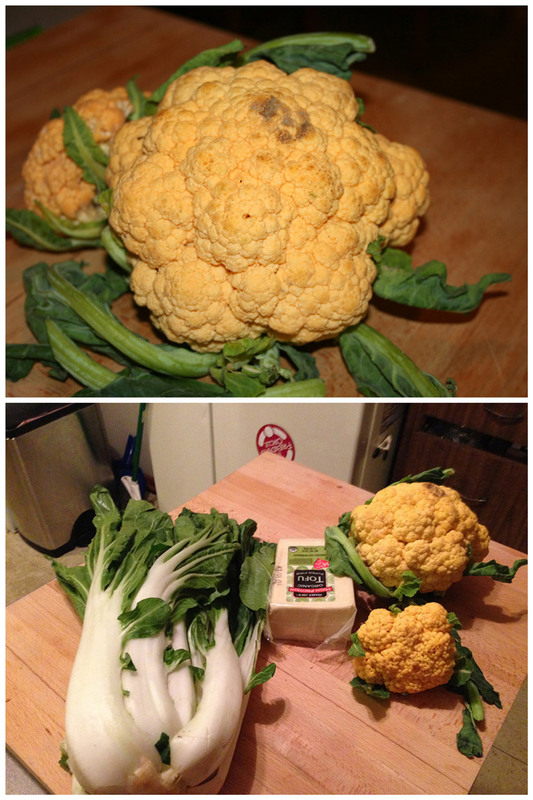 On a recent recent night, my dinner came from some fresh and massive bok choy from my co-op and an orange cauliflower from the farmer’s market outside my office building. I have never had this particular kind of cauliflower, but since the sign labeled it as “Cheddar Cheese Cauliflower,” of course I had to pick it up. The farmer told me that the cauliflower would taste a bit sweeter than the standard variety. I couldn’t tell the difference, but it was still mighty tasty! I recently discovered the “Super Extra Firm” tofu at Trader Joe’s. It’s pre-pressed, so it requires minimal draining. It’s perfect for quick dinners like this one. I cubed up the tofu and then washed and cut up the veggies. I then did a quick stir fry along with some garlic, ginger, tamari, Hoisin Sauce, sesame oil and miso. The dish came out perfect. I served it with some Basmati rice, but brown rice will also work just as well. A regular white cauliflower will work just as well as the “Cheddar Cheese” variety. 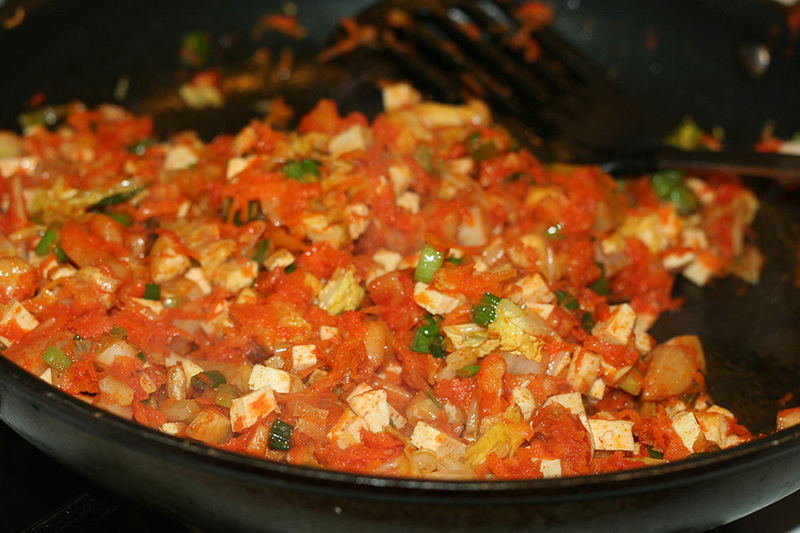 Once the tofu has browned, add in the salt, onions, garlic, ginger and garlic and saute a few minutes. 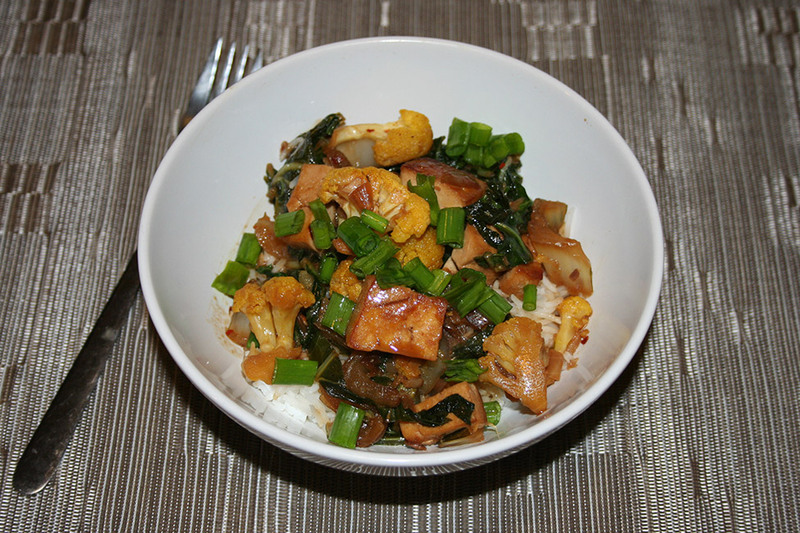 Add in the cauliflower and bok choy and stir fry for about five minutes. Let the veggies soften. You don't want them too mushy. Mix up the soy sauce, miso, hoisin and vegetable broth in a small bowl and then pour over the stir fry. Add in some of the scallions and the red pepper flakes. Taste and add additional salt as needed. I was fasting the other day in preparation for a test, and all I could think about was bánh mì. I walked by the bánh mì cart near my office and my mouth was salivating. I decided that no matter what, I would be making bánh mì sandwiches for dinner this weekend. 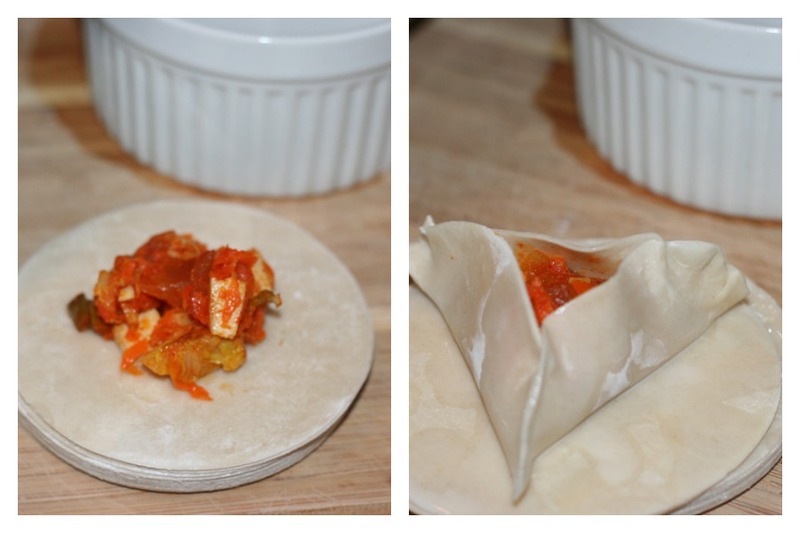 A while back, I made some vegan bánh mì here on the blog. From experience though, I knew it was missing something. It was missing the traditional pâté. It adds another layer of flavor to the sandwich and some needed moistness that pairs well with the other ingredients. This time around, I knew I had to make my own baguettes AND make some pâté. Pâté is traditionally made from pork and chicken liver in these sandwiches. You all know that’s not my style. I’ve had some vegetarian eggplant liver before, but I’m the only one in this house who loves eggplant. I decided to make this amazing spread out of mushrooms and walnuts. I toasted the walnuts in my cast iron skillet. Then., I sautéed up some mushrooms along with some shallots, garlic, ginger and spices. The smell was already so good. Once the mushrooms were done, I placed everything in my Cuisinart food processor and processed away. 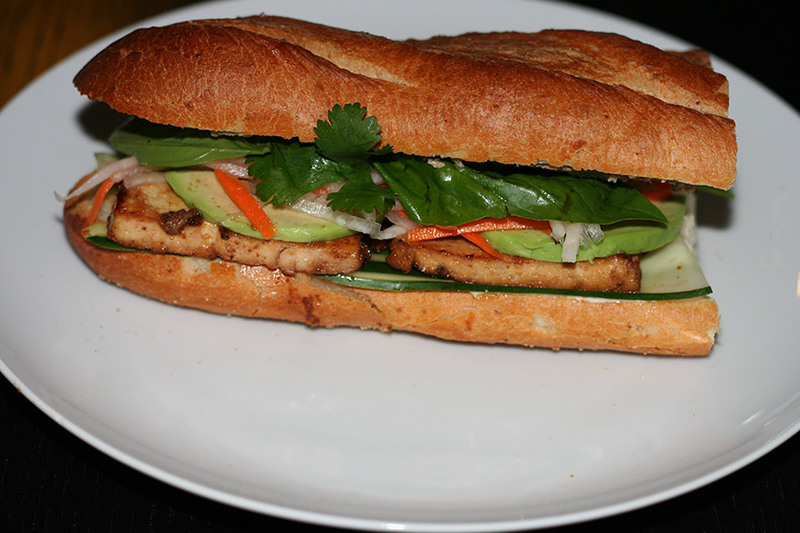 It came together fast and made a huge difference in our bánh mì sandwiches! This would also be perfect as a dip with crackers or in place of traditional meat liver on shabbat and holidays! 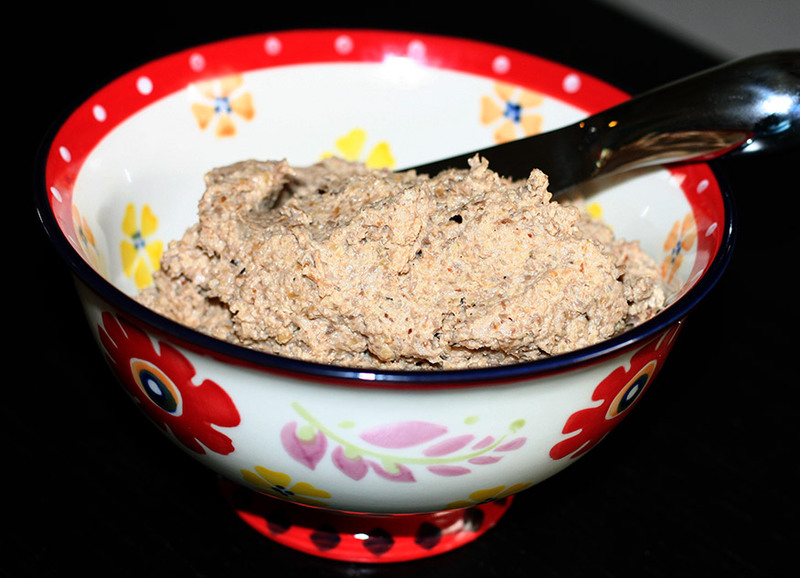 This vegan mushroom pâté goes perfectly with my vegan banh mi sandwiches! Heat up your skillet on medium high heat. 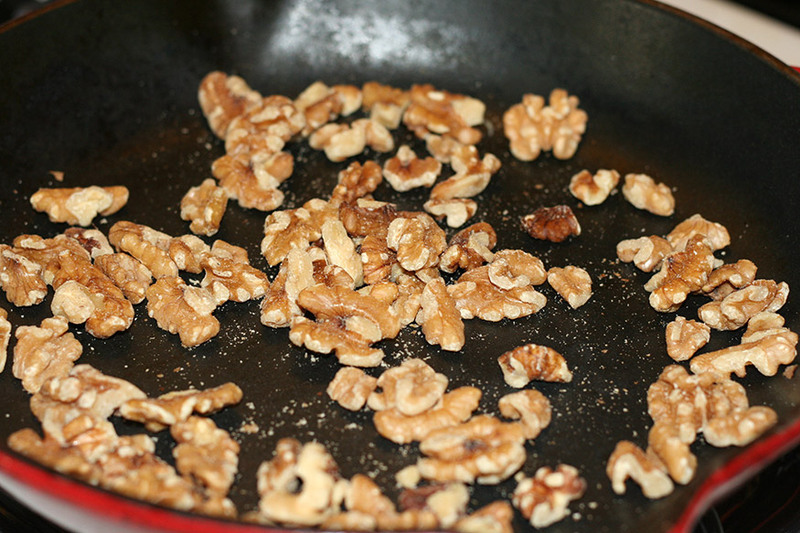 Toast the walnuts in the dry skillet for about 3 minutes. You do not want to burn the nuts. 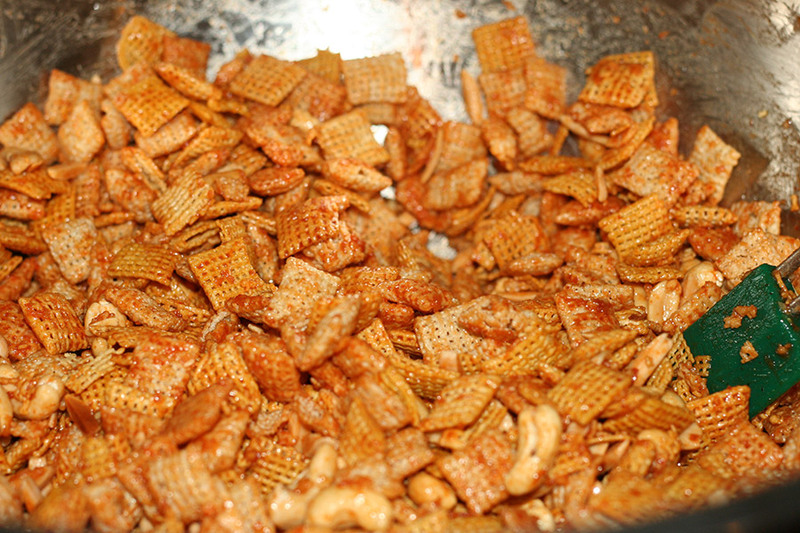 Remove the walnuts from the pan and set aside. Keep the pan on the heat. Add the oils to the pan. Let the oil get hot. Add the shallots, garlic and ginger to the pan. Cook a couple of minutes. Add the mushrooms to the pan and cook another few minutes. Stir in the tamari, salt and pepper. Once cooked, turn off the heat. Place both the walnuts and the mushroom mixture in your food processor and process well. It should be a paste. Taste and add additional salt and pepper as necessary. We had some leftover salmon from the other night. I wanted to use it up, but I am very bad about using leftovers. I just don’t like them. Salmon is one thing that I do use though. I usually like to turn it in to a salmon salad the next day. This time around though, I decided to turn it in to some salmon burgers. 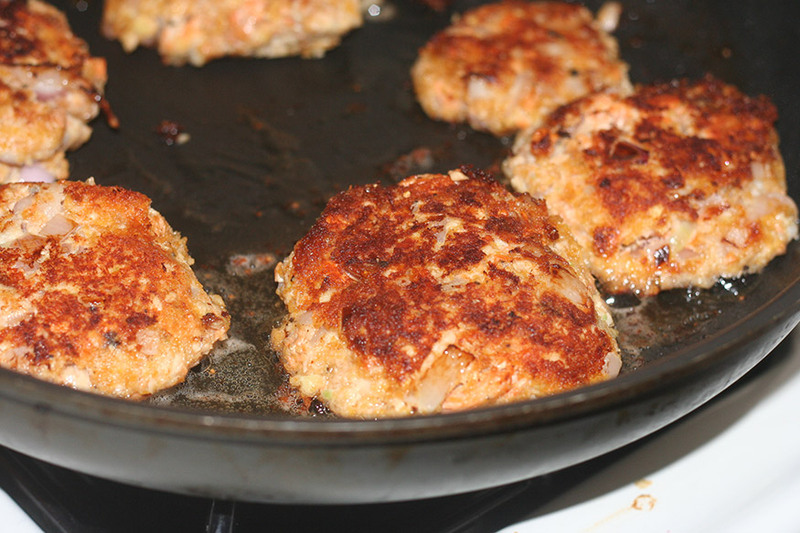 Similar to my baked salmon patties, you can use either recently cooked salmon or even some canned salmon. Both will work, but I always prefer to use fresh salmon when possible. This salmon burger comes together in a similar way as the salmon patties, but the flavors are amped up a bit with the addition of the wasabi and ginger. 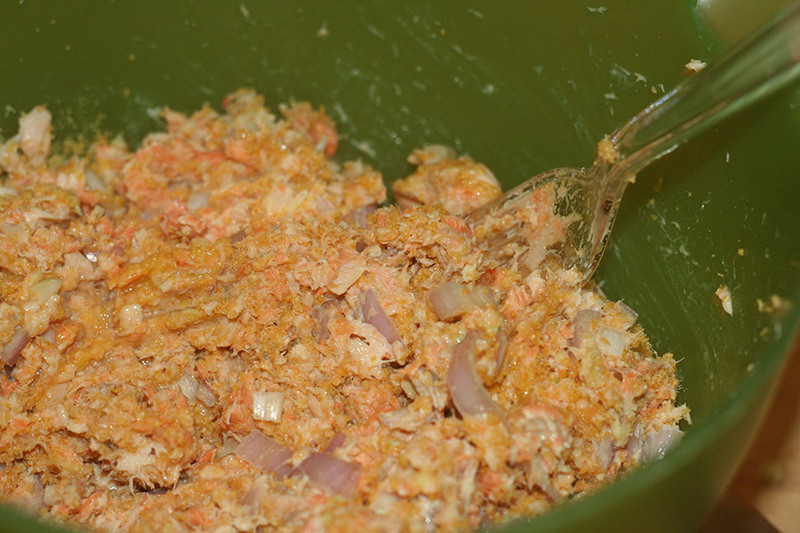 I mashed up my leftover fresh salmon in a bowl. You can use canned salmon if you don’t have fresh salmon lying around. To the salmon, add an egg, some wasabi, soy sauce, sesame soil, ginger, garlic, corn flake crumbs, chopped shallots. You mix it together and form in to burgers. Fry the burgers in a large pan. 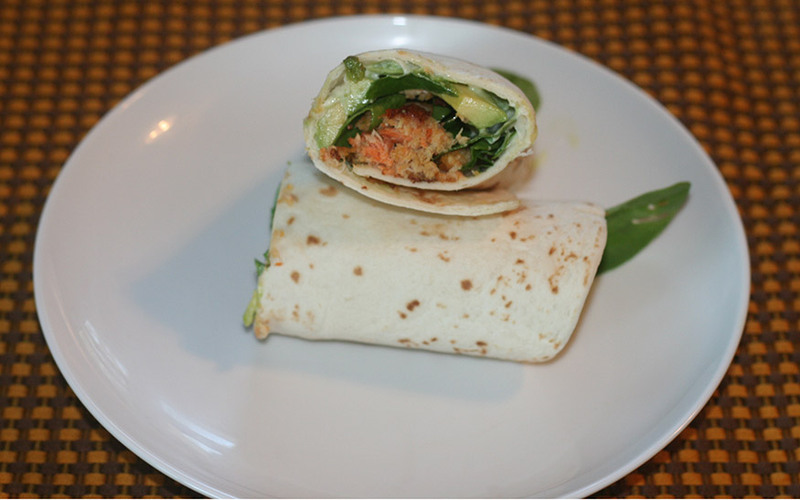 Serve in wraps with avocado, spinach, additional wasabi and mayonnaise. So good! Make it now! Mix in the rest of the ingredients. Mix well. Grill on a barbecue, or fry in a large fry pan on medium-high heat in one tablespoon of oil. The burgers should be lightly browned on both sides. Wrap up the burgers in a tortilla with additional wasabi or sriracha, some mayonnaise, some sliced avocado and spinach. This month, in our Kosher Connection link-up, we are sharing “The Best Thing I Ever Ate.” I had a very hard time with this. There are so many “best things” in my life of eating. Even the Food Network show breaks it up in to categories! If I could do some sort of award ceremony, I could give some special trophy for at least 10 different foods! I don’t have one favorite. I love so many different dishes for so many different reasons. I decided to share with you this one dish today. These Hong Kong Pan-Fried Noodles with Mock Duck are simple to prepare, and it’s a dish that’s pure comfort food. It has a flavor and mouth feel that I crave every so often. 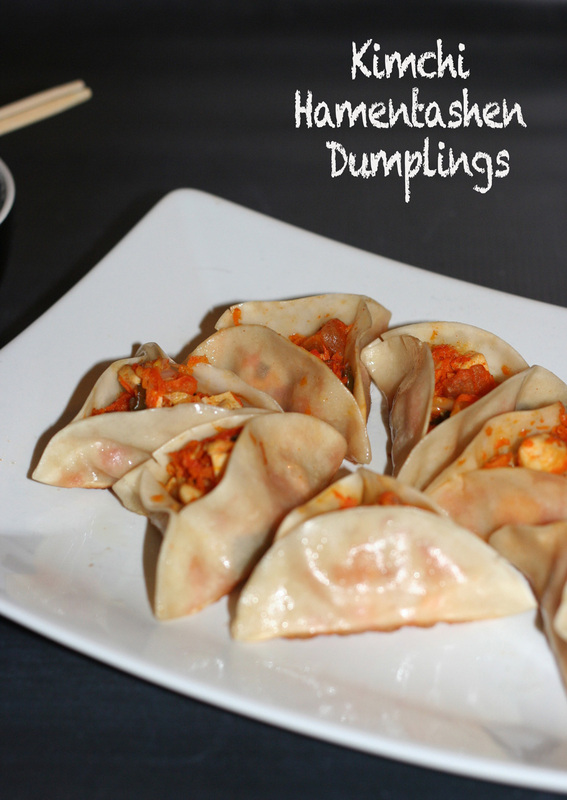 This dish brings me back to dinners out with my family at KinhDo Restaurant in the Uptown area of Minneapolis. 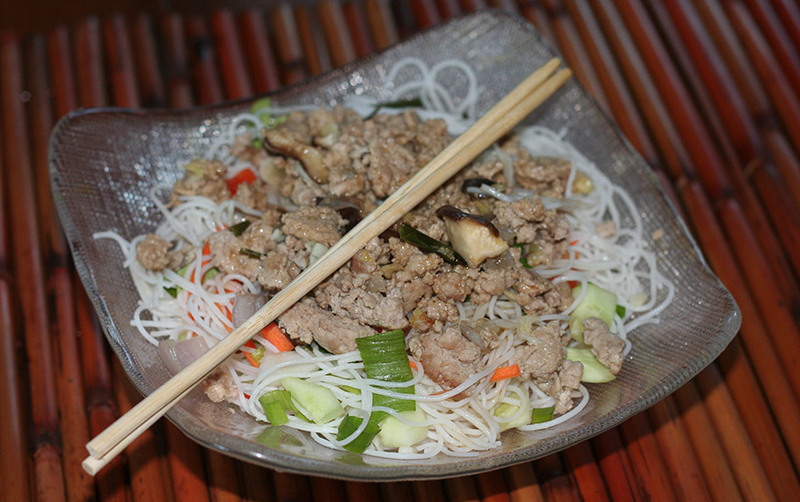 One of the dishes we often got was this fabulous mock duck noodle dish. More recently, I had a noodle dish at Buddha Bodai in Chinatown that reminded me of this dish. I decided to combine the two. I trekked out to Chinatown last week to pick up some of the ingredients. Hong Kong Supermarket, one of my favorite stores, carries a huge selection of Asian noodles and sauces that happen to be kosher. With some vegetarian oyster sauce and noodles in hand, I headed back home to make this dish. I was very happy with the results. Boil a pot of water. Cook the noodles for 1-2 minutes, then drain and rinse. The noodles are already cooked and don't need to be cooked any longer than that. Heat up the oil in a large wok or pan. Add in the onion, garlic and ginger. Cook for 4-5 minutes. Add in the mushrooms and mock duck or seitan. 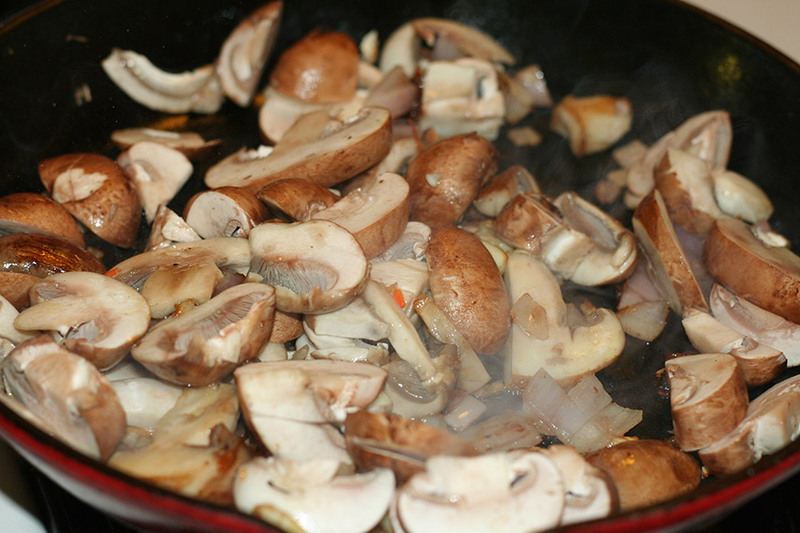 Cook for around 5 minutes, until the liquid from the mushrooms evaporates. Mix in the cooked and drained noodles. Stir to incorporate. Stir fry the noodles a bit. 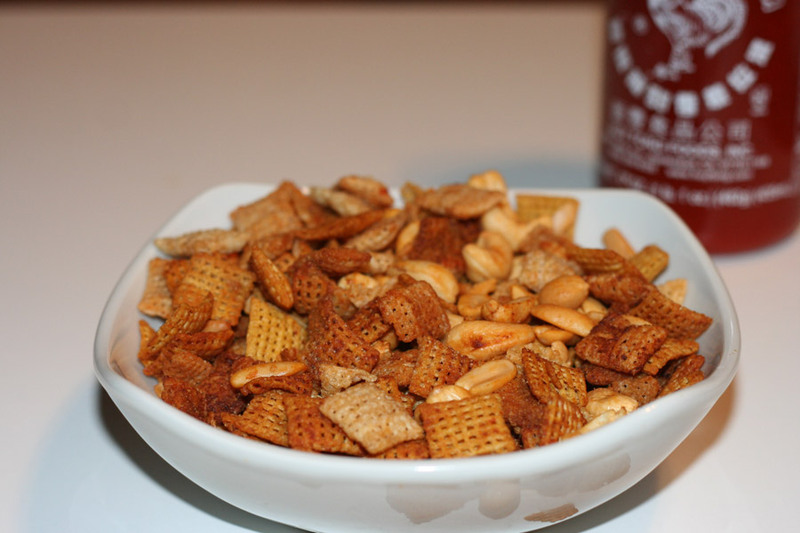 In a small bowl, mix together the sauces with the crushed chili peppers. Pour the sauce in to the noodle mixture. Stir well. Mix in the fresh bean sprouts. Stir fry another few minutes. Mix in half of the chopped chives. Garnish with the rest of the chopped chives. Serve with some chili paste on the side. What do you do when everyone is hungry and it’s 7:30 pm? We had been grazing throughout the day, so hunger and the whole dinner concept dawned on us much later than a typical day. The big kid was begging for Chinese food. Of course, she was hoping for the take-out variety. The hubster suggested a stir fry. I kindly suggested he pick and chop the veggies – to which he turned down. Harumph. Dinner still had to be made. I tossed some rice and water in a pot and peeked in the fridge. We had just been to the Korean market, so were flush with tofu and veggies. I had some chopped scallions and ginger left over from the scallion pancakes. Stir fry would work. I always have a variety of asian sauces around. I hoard them when I find them acceptable to eat. 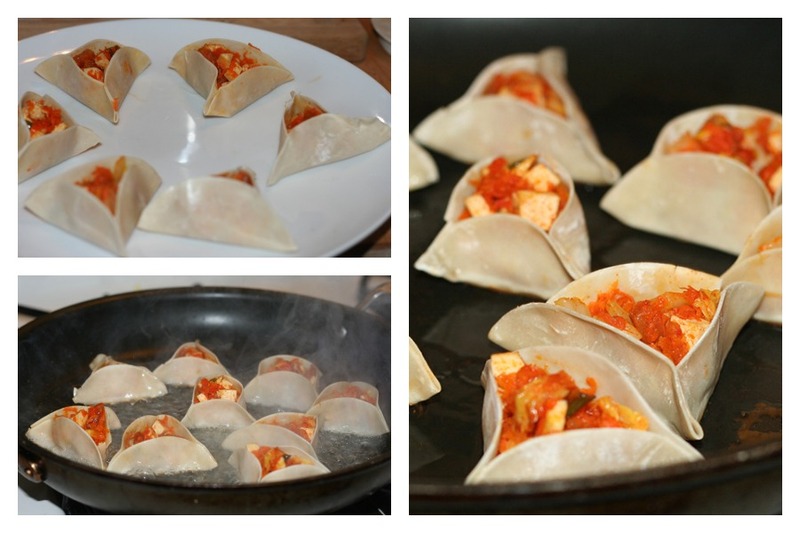 I picked up some yummy looking five-spice tofu when at HMart. I love when I find random kosher things there. I get giddy. This five spice tofu comes already pressed and ready to serve. Dinner was ready in around 10 minutes. Ten points for me! Heat up the vegetable oil in a wok or large deep saute pan. Add in the sesame oil when hot. Stir in the garlic and ginger. Let it get a bit fragrant and toss in half of the scallions. Stir in the tofu, snap peas and the mushrooms. Cook for a few minutes. Maybe five. Add in the last three ingredients. If you can’t find a kosher black bean sauce, you could substitute with some miso paste. As I mentioned before, I tend to hoard obscure kosher products when I find them – or I figure out how to make them myself. Add in the remaining chopped scallions and plate it up with some white rice. On a side note, anyone want to go in with me on a large quantity of kosher fermented black beans? Big plans, folks, big plans…. Wednesday evenings are one of the nuttiest in our house. Both kids have assorted activities. We do not get home until 7:30, making the whole dinner routine a bit tough. I don’t like to do fast food, nor do we have any decent kosher fast food nearby. I do admit, I often turn to the more processed/frozen varieties of nutrition too often on those nights. I prefer to give my family a more balanced home cooked meal. This past Wednesday, we had the perfect dinner. We had a soy ginger salmon over whole wheat couscous with mushrooms and herbs. Yum! Marinate your salmon for at least 30 minutes. You have two options for cooking this up. You can sear it and finish in the oven, or you can broil for 15 minutes or so on high. I chose to sear for 10 minutes and then finish in the oven. Heat up the marinade ingredients in a sauce pan. Heat to boiling. Pour some of this sauce over the salmon and couscous. I would show you a picture, but the camera didn’t cooperate. I will make this again though. So good!